Thomson Reuters and Bloomberg vet Tricia San Cristobal joins T-REX as Chief Product Officer, bringing deep financial markets, SaaS, and data management experience to take product strategy to the next level. 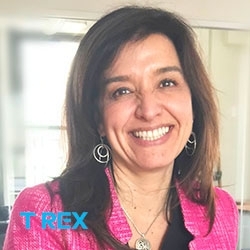 New York, NY, April 03, 2019 --(PR.com)-- T-REX, a leading data services and software provider for complex financial markets, today announced it has appointed Tricia San Cristobal as Chief Product Officer. San Cristobal joins T-REX on its mission to fill a critical technology gap for complex asset classes through modern data management and analytics solutions. In this role, she leverages over 20 years of experience to guide the strategy and product development for the company’s current and next generation of solutions. San Cristobal will report directly to founder and CEO Benjamin Cohen and oversee a global team of data analysts and product managers across all T-REX products. San Cristobal joins T-REX from Thomson Reuters, where she held a number of senior management roles for the company’s Enterprise Platform, Data Solutions, and Elektron as a Service solutions. Under her leadership, the company embarked on a number of strategic new initiatives to innovate and expand their data platform lines of business. Responsible for combining these software and managed platform and data solutions with a sophisticated commercial strategy, San Cristobal’s team delivered best-in-class products to financial markets clients globally. Prior to Thomson Reuters, San Cristobal held several product and business management positions at Bloomberg L.P. There, she was responsible for launching Bloomberg’s real-time feeds products that later formed the basis for Bloomberg’s Enterprise Products and Solutions Division. T-REX’s product suite equips practitioners in complex markets with turnkey managed data services, analytics, and reporting solutions via a cloud-based platform. The full investment lifecycle solution modernizes data management and workflow for underserved illiquid asset classes, improving risk mitigation and decision-making for all market participants. San Cristobal is a sought-after speaker and writer on innovation, fintech, data, as well as the topics of diversity and inclusion. She has served as a women-in-technology mentor for the Girl Scout Council of Greater New York Leadership Institute. T-REX combines sophisticated SaaS technology with big data and asset class expertise to drive down cost of capital and reduce risk exposure for complex markets. Solutions are designed to address friction at each stage of the investment lifecycle -- from origination to securitization or whole loan sales to investment. By empowering efficient, transparent finance in these markets, T-REX creates significant investment opportunities across nearly $500 billion in new assets every year, benefitting developers, originators, investment banks, rating agencies, accounting firms, and investors. Visit www.trexgroup.com to learn about our products for Structured Credit Markets and for Energy Project Finance.